Don’t get scared! Sign up for a frighteningly good time at GRC’s annual Halloween Spooktacular on Sunday, October 21st. Spooktacular runs from 1:00-3:30 p.m. on October 21st and includes 2.5 hours of Cosmic Bowling plus a haunting Halloween lunch. Are you a GRC youth bowler? Your cost drops to just $9! A Halloween costume contest is also part of the fun, with winners selected in each age group. Limited spots available-prepaid advance registration is required, so don’t delay! Call GRC at 262-658-8191 or stop in and see us to sign up. We promise not to scare you–too much. An extra treat for all GRC youth bowlers with prepaid reservations: you’ll be entered to win a $75 GRC gift card! 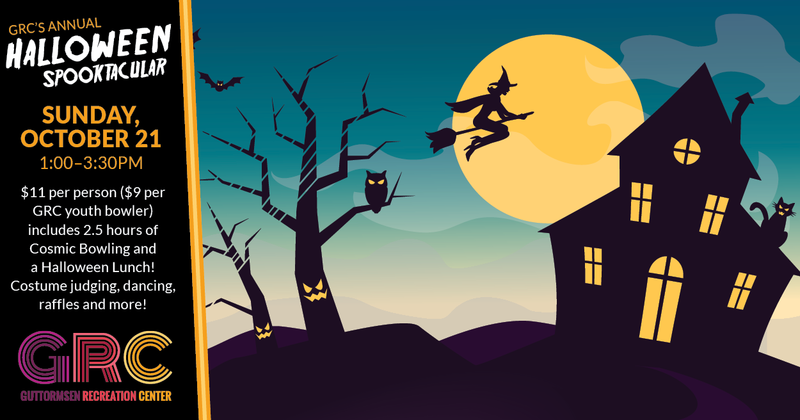 Grab a costume, grab your friends and make your reservations now for GRC’s Halloween Spooktacular!